Police and fire officials said at least nine fire fighters were being questioned by investigators in connection with the reported theft. Gentle said the matter has been handed over to the police and stern action would be taken against those found culpable. “This is not something that we condone or take very lightly. Those found culpable will be dealt with to the fullest extent,” he said. Other sources also told Demerara Waves Online News that a number of crew members and passengers have also claimed items, including passports, electronic devices have been stolen. 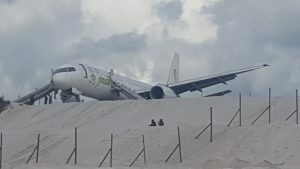 The fire fighters were among the first responders who entered the plane after it made an emergency landing at the north-eastern end of the runway. The pilot had reported a hydraulic failure 10 minutes after departing Cheddi Jagan International Airport and requested permission to land. On landing, one of the right engine and landing gear broke off.